What you are looking at right now is a blog statically generated with a bash script. Hacked together in notime. I'm a big fan of minimalism, so that felt like the way to roll. 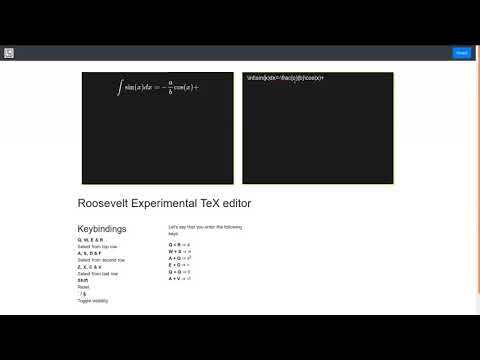 The input is written in markdown so it's easy to write in and to convert to whatever format. The blog itself is generated by a small bash script. Metadata such as creation time and updates are taken straight out of git. This blog will deal with my research into text entry system. Expect a quite comprehensive analysis on said model. My obsession with computers in general goes back many a year, however for the last few years I've been thinking constantly on how to reinvent text entry. For christmas '18 I put together a rather silly game, where people could test different approaches of input. Playable with a gamepad, might want to check out configuration first. Appart from that I find that an interesting application for my findings would be for math editing. Where I think I've found quite a nifty approach, balancing speed and learning curves quite nicely. Up until december '18, I was unaware of the Dasher project which seems to deal with a lot of the issues in a similar manner. Primarily to make use of an compression algorithm transfered to the user level. The difference in approach there is that the Dasher works via continous movements and I took a more discrete approach. The dasher model compresses via arithmetic coding whereas huffman trees seemd like a better match to me. Click images for video. Appologies for audio quality in advance!